This was recorded a Wednesday evening in October 2015 at the Alma pub in Cambridge after Tom and Ezio's Songsmith session, on the small piano in the corner. I made this piano piece about a couple of years ago and it has always reminded me of the atmosphere of musicians and other friends meeting up in pubs. So eventually I managed to capture a bit of this with my sound recorder that night. However it was not easy to illustrate as it can be a bit tricky to take a photo or make a video in a pub, especially to get a picture that works with the piano tune. 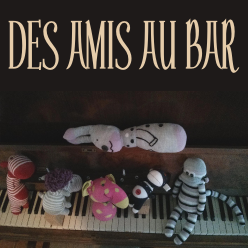 Luckily my friend Jenny was happy to lend me some of the dolls she had made with socks and as you can see they're all a happy bunch of friends at the bar on the piano keys... So special thanks to Jenny for that! P.S. As you can hear around the end of the recording, someone was asking me to play "Mario" next but I've never learnt it so I didn't play it. Something to learn in 2016!